After a few rather disappointing installments, I’m happy to report that the Chicagoland series seems to have taken an upward turn. A significant improvement was noticeable in House Rules, but with Biting Bad, we’re right back on track. This eighth installment is just as good as the first two and it decidedly proves that the series has a lot more to give. In terms of plot, Biting Bad offers more of the same, but it’s a recipe that undoubtedly works. Merit and Ethan face enemies both human and vampire, all equally dangerous. There is no downtime, no rest for the Cadogan house, and consequently, no time for our favorite couple to just enjoy each other’s company. They have to defend against everything from bombs to power plays, but at least they do it together. It was strange, but oddly comforting to see Merit bested by a much older and much stronger vampire. Urban fantasy heroines tend to win against all odds, which can be almost ridiculous sometimes, but Chloe Neill steered clear of that trap while keeping her heroine strong and believable at the same time. I found myself smiling at Merit’s defeat and her need to be rescued by her liege because all of the sudden, I wasn’t seeing a UF protagonist, I was seeing Merit in flesh and blood, strong but vulnerable, smart but not all-powerful. 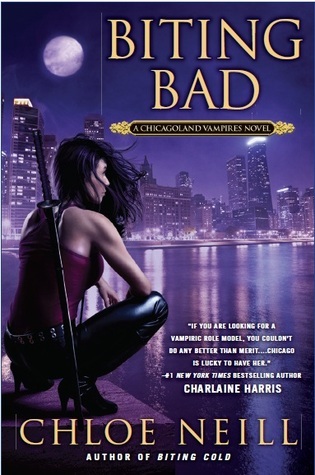 In addition, Neill finally took this where Patricia Briggs and Ilona Andrews went before her: there is no more unnecessary tension and second thoughts between Merit and Ethan. They face challenges together, and they do it wonderfully, as a real couple should. It’s them against the world and it works so well, it almost brought me to tears. The only thing I find odd at this point in the series is the short time span in which these eight books happened. Ten months seem ridiculously short when one remembers everything that happened to Merit and Ethan, and with this detail in mind, their relationship and Merit’s strength lose some of its value and plausibility. If you decide to start this series, or just catch up, forgive Neill and Merot for those two weaker installments. Keep in mind that things get infinitely better and just keep reading until they do. Chicagoland deserves your patience. I agree, I really liked this one and it got back on track! I'm hoping the series will continue like this! I think I've seen this series around before. It's always a weird feeling to read a book then discover it was in only a short spance of time. I liked the first two book in this series, but haven't had the chance to get back to it. I'm glad to hear that the series is back on track after the last few disappointing installments for you, Maja. I'm so glad that there's no unnecessary drama between Ethan and Merit. That's one thing that always annoys me in these long UF novels. I am behind on this series but in part it is because I have heard some rather unpleasant things about the past few. I am glad this is getting back on track but sad that Ethan and Merit don't have more time to be together. Nice to see that there's not a lot of insecurities between them any more I might catch up to this series after all ;) an did you finish reading magic rises ? OOoh nice review! I have yet to read this one, but it's in my TBR mountain! Looking forward to seeing things get a little better as well! Love this series and don't want to see it crash and burn. It's only been 10 months? Okay, I did know that but I didn't really stop to think how crazy it is that all this crap's happened with/to Merit in that short of a timespan. And there's the whole "I'm so in love with Ethan" thing (yes, I love the couple but...), that's a little quick. Oh well. I still love the series. Onto the next one!! I haven't read any of these books, but I am curious. Good to know that things are picking up! It's pretty common it seems for longer series to have a couple books that don't work as well. Bummer, but it happens! Everyone seem to be disappointed with this book in the series. I haven't started the series so I don't know much but then again if this one was good for you I'm not sure I want to start this series at all. I'm glad you enjoyed and I hope that this series gets even better with next book :) Great review. I should pick up this series, I was really interested in reading them, but after a while I just lost interest. I have heard good things about Merit and Ethan's characters, and I am really excited to see how their relationship works out! I also saw a spoiler about Ethan (really pissed, people seriously need to use spoiler tags! :() and am wary of starting this series because of it, but I'm going to trust that it gets better and hopefully soon, finally start this series. I'm glad this addition was much better than the last couple of books and fingers crossed it stays that way for future books too! Great review, Maja! I'm glad you enjoyed this! Looks interesting. Is it heavy on the paranormal romance? Glad things are looking up in the series for you -- it's great that you stuck with it!